Whether your entry space is expansive or barely there, this can be a tricky spot to furnish. This is the area where you’ll welcome guests, friends, and family, and you want the to feel welcome and comfortable in a space that reflects your personality. 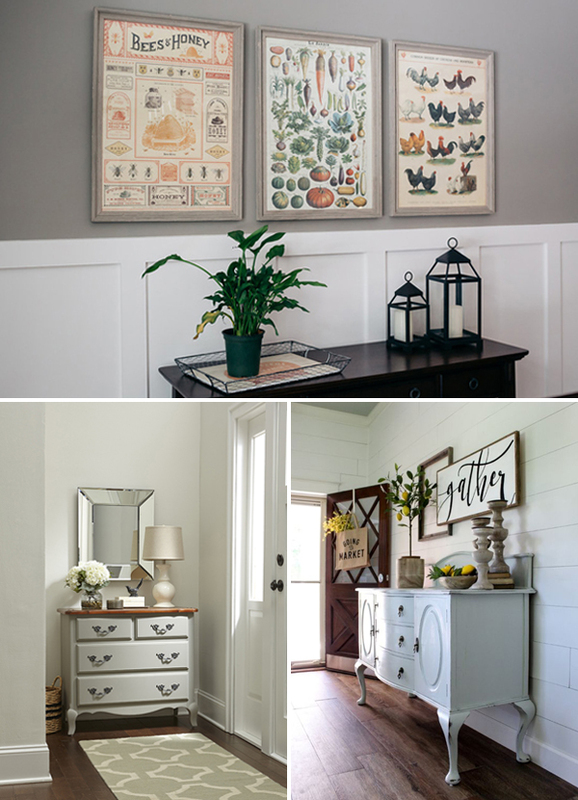 We’ve rounded up three different entryway styles and tips for implementing each one in your own home. If you get stuck in designing or have no idea where to start, stop by and visit with us! We love discussing our customer’s homes and finding a piece or two that will be the perfect fit. With the popularity of America’s beloved Fixer Upper couple Chip and Joanna Gaines, nearly everyone is familiar with the farmhouse style. We love these three takes on the modern farmhouse style, via Town and Country Living, Home Remedies RX, and Little Vintage Nest. Creating a farmhouse entryway: Use a mix of natural wood and painted pieces, incorporating either white or cream with pops of deep greens, pale blues, and black or grays. Bring outdoor elements indoors with fresh greenery or indoor plants and add vintage baskets for that true farmhouse feel. We almost always have at least one or two tobacco baskets in the shop that are perfect for hanging. If you like a more minimal style, keep things simple in your entryway. You can achieve a complete look without filling the space to the brim! Take inspiration from these ideas via Brownstoner, Southern Weddings, and Bria Hammel Interiors. Creating a simple entryway: Pick an overall “feel” for the space, like “light and airy,” or “rich and moody,” and let that style guide you. Choose a furniture piece with clean lines and a minimized color palette, and add a single, large wall element like a mirror or large print. Incorporating a single lamp or tall branches displayed in a large vase or jug adds height without overdoing it. As we’ve shared before, adding vintage pieces to your home is an economical way to add depth and richness to your space, and your entryway is no different! We love these examples of vintage pieces anchoring the entry from Rustoleum, Southern Weddings, and Cotton Stem. Creating a vintage entryway: Pick a single vintage focal piece for your space, such as a buffet, small dresser, or series of vintage prints. And if you find a great furniture piece that needs a fresh look, be sure to check out our Heirloom Traditions chalk type paints next time you stop by. Balance the vintage feel with modern elements, such as lighting, artwork or a wall mirror, or indoor plants. Alternatively, use a new piece of furniture and add a pair of vintage lamps for a finished look. You can find great pieces for any of these looks on your next visit to Cottage Grove Vintage Market! We're open Wednesday-Friday 10am-5pm and Saturday 10am-3pm.